"When a man of heavenly worth sins in Hell darkness shall reign on Earth"
A message from other side - an omen of the impending apocalypse. A message intended for one man and that man is the only one who can avert Armageddon, saving the soul of every man, woman and child on Earth - that man is Joe Costello. However, he is also the same man who could bring about the reign darkness. Inspired by Dante Alighieri’s The Divine Comedy, Joe must battle his way through the nine circles of Hell – his escape being the only way to stop the end of the world. Not only will he face all manner of Hell’s demons, he will also face his own. But he will not face this nightmare alone, as he is guided through each level by medium and ghost-whisperer, Layla Thorne. 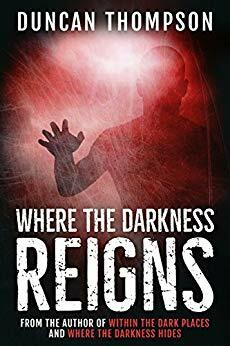 Where the Darkness Reigns is the epic conclusion to Within the Dark Places and Where the Darkness Hides. When constructing a story that spreads across three books it can be hard at times to keep the same tone running throughout and especially not to ruin any established characters. Thankfully Duncan Thompson's final (?) book in his 'Dark places' series manages to keep everything together and makes sure to wrap up every plot twist and turn neatly. It would be wise as a reader to pickup and read the first two books in this series (Within The Dark Places and Where The Darkness Hides) to get a good idea about the main character Joe Costello and his journey to save Raven's peak against the shadowmen. Overall I have really enjoyed reading this series of books and I am excited to read what the author will do next.